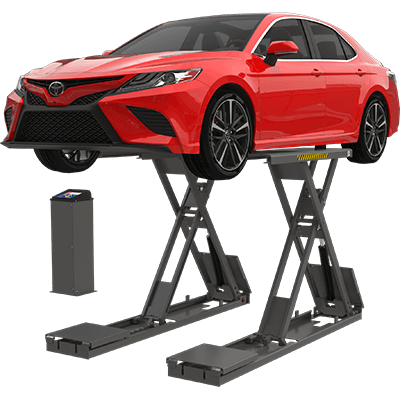 Full-rise scissor lifts are popular in body shops, professional service bays and even home garages. Unlike low-rise lifts and mid-rise lifts, these designs let you stand upright while you work. Plus, compared to two-post and four-post ​lift designs, they offer a smaller footprint and no side-posts to clutter your work area. We offer full-rise lifts in both frame-engaging and drive-on designs, so choose the model that best suits your workflow. BendPak’s full-rise SP-7X boasts a mighty 3,175-kg. lift capacity. It takes up a minimal amount of floor space, so it fits nicely into narrower bays. 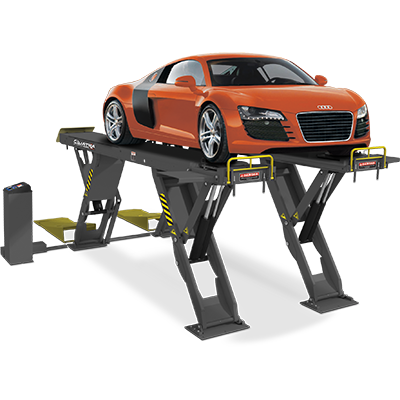 As a frame-engaging ​lift, it easily accommodates most passenger vehicles and light-duty trucks. It also comes complete with pneumatic safety locks, rubber lifting blocks and an open centre for full undercarriage accessibility. 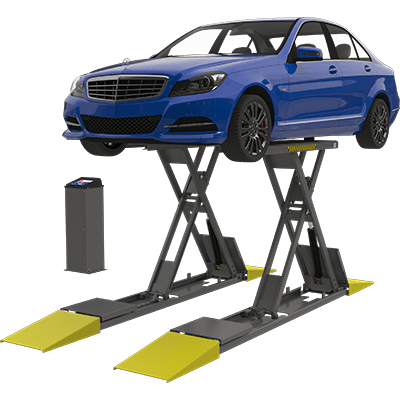 BendPak’s reputation for making increased durability, safety and productivity is on the line with every lift we sell, so we back up our promise of unsurpassed car ​lift quality with our industry-renowned 5-2-1 warranty. Others might be interested in the XR-12000. This 5,443-kg. capacity, quad-opposing full-rise scissor lift is engineered in such a unique way, the entire lift is patented. Everyone sells two-posts and four-posts, but no one has anything like the Quatra. True vertical lift is almost unheard of at such a high weight class, as is open access from all four sides. That's why the XR-12000 is truly one-of-a-kind, ideal for heavy-duty applications when space is at a premium. Discover more about these unique designs to see how BendPak can put a safe, versatile and extremely space-conscious full-rise scissor lift in your ​shop or ​home today. This flush-mount version of our full-rise scissor lift is ideal for shops that are limited in space but have a huge demand for performance. The SP-7XLF has all the lifting height of a two-post lift without the columns that take up precious shop space. Features a 55.8 cm x 160 cm lift platform, equalization torsion bar, hardened pivot pins, dual hydraulic cylinders and ergonomic controls.